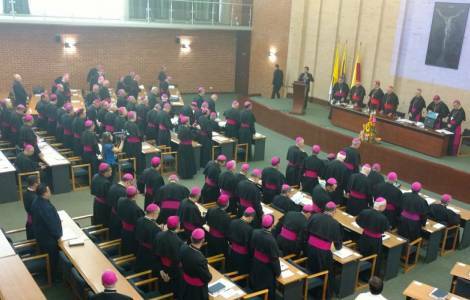 Bogotà (Agenzia Fides) - From today, February 3, the Colombian Bishops are gathered for their Plenary Assembly for a week, during which they will study and discuss the social dimension of evangelization. In the note issued by the Episcopal Conference (CEC) and sent to Fides, the Secretary General of CEC, Mgr. Elkin Álvarez Botero, Auxiliary Bishop of Medellin, explains: "It is a question of resuming the Christian message that invites us to seek the well-being and the common good of peoples". The Bishop emphasizes that the life of the Christian is not only of a spiritual nature, but must express charity and love through concrete actions that help to transform reality. The Assembly will end on 11 February. The country is still shaken by the attack on the General Santander Police School of Bogotá on January 17, which caused the death of 21 people and seventy were wounded (see Fides 18/1/2019). It was the most violent explosion in the capital in the last 10 years, in a place full of young people preparing to put themselves at the service of peace in their country after more than half a century of conflict. "Total reject of all forms of terrorism and violence. We continue to seek peace through dialogue, reconciliation and social justice", said the President of CEC, Archbishop of Villavicencio, Oscar Urbina Ortega.